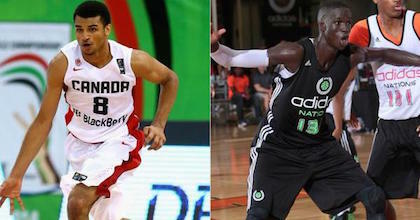 Jamal Murray and Thon Maker are two possible pioneers in the world of Canadian basketball. Read about how they are reaching this status. Orangeville, Canada (heinnews) – Imagine producing loads of talent only to watch almost all of them leave the country, feeling they need to go elsewhere to get the exposure needed to achieve their goals. 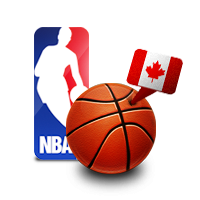 That is the case of Canadian basketball as hundreds of high schoolers still years from graduating decide to move to the United States to attend high-level college preparatory schools with the hope of eventually reaching the NBA. But take a drive one hour northwest of downtown Toronto and you will find a group of individuals trying to buck that trend – and maybe even start a new one. With the radio producing “Modern Music” from 102.1 The Edge, the drive up to Orangeville is quite peaceful – passing first through Brampton – home of Canadian ballers such as Tyler Ennis, Tristan Thompson and Anthony Bennett. With Florence + The Machine, Modest Mouse and Death Cab for Cutie accompanying one on the trip northwestwards, the flatlands are eventually left behind as Highway 10 passes through Caledon and starts upwards into Dufferin County – a lofty plateau at about 1,700 feet above sea level and about 1,400 feet above the level of downtown Toronto. On the way back, the drive provides a nice skyline view of Canada’s largest city. 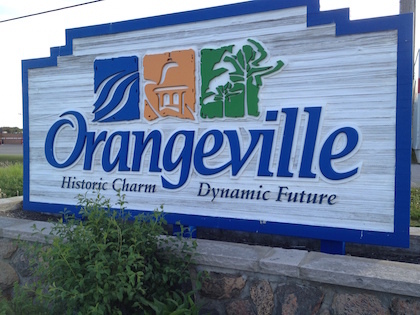 Orangeville sits at about 1470 feet and the sign on the edge of the town promises: “Orangeville: Historic Charm, Dynamic Future”. With a town motto like that, why not pick this place to create one of the most-dynamic and possibly history-making basketball programs in Canada – if not the world. Looking at the Frequently Asked Questions on the city’s website, it seems like most of the people in the some 28,000-resident city are interested in what services are provided at the Orangeville Public Library and if they can have an open fire, how to obtain a burn permit or how to become a volunteer firefighter. But do the Orangeville residents realize that two of the best 1997-born basketball players in the world are being trained to become likely NBA stars. That is exactly what is happening at Orangeville Prep, the Ontario high school that Jamal Murray and Thon Maker are attending and putting on the map. Both players can already be considered pioneers in the world of Canadian basketball. Coincidently, the two players were born just two days apart in February 1997 – Murray on February 23 in Kitchener, about 100km west of Toronto in Southern Ontario; and Thon Maker on February 25 in a village in what is now South Sudan. Both players also are two examples of how important luck can be in producing a high level program. But we’ll come back to that. Turning off Highway 10 shortly past the “Historic Charm, Dynamic Future” sign onto Highway 9, the destination leads another three kilometers to a town called Mono which houses the renown Athlete Institute. 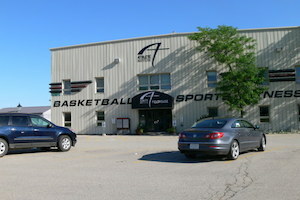 There is a training center and a fieldhouse, with a bubble dome attached to the back and an Athlete Institute bus parked along the side of the fieldhouse. Being a few minutes early for the interview provides the chance to check out a bit of the facilities including the excellent court. On the walls opposite of the entrance to the court are over-sized sponsor posters featuring great young Toronto ballers Andrew Wiggins and Tyler Ennis, watching over the next young Canadians to follow their footsteps to the NBA and providing them with inspiration. That sounds like everything that is written in print about the facilities and what they are designed to do. A couple of Orangeville Prep players make their way into the facility, apparently late for practice. One of the youngsters has to explain himself to Orangeville head coach Larry Blunt, who had made his way down the hallway to pick up his visitor. After clarifying the tardiness of his player, Blunt says hello to the visitor from Toronto with a healthy, warm-felt handshake, asking if the trip up from the booming metropolis went well. Blunt, a 30-year-old American born and raised in Virginia, leads the visitor to his office – a typical simple high school coach office, sitting just a closed door’s width away from the court with three chairs and a desk, behind which Coach Blunt takes his seat. “The Athlete Institute was created to help their goals on and off the court from personal, social and athletic standpoints. It was always bigger than basketball,” Blunt begins his description of Athlete Institute, which is essentially the training, work-out, eating facilities for the players from Orangeville. Athlete Institute started five years ago and two years ago, Blunt arrived and organized the partnership with the Orangeville secondary school, which has about 1,600 students in it. Orangeville Prep coming into the mix was an important part of Blunt’s plan, which was shared by Athlete Institute president Jesse Tipping and his owner father James, who built his business in the trucking industry and founded the institute in 2010. The younger Tipping played basketball, going to Aurora’s St. Andrew’s College, where his sports development lagged behind his superb education. His siblings meanwhile went to the IMG Academy in Florida, where they excelled athletically but did not get the same education as Jesse. That motivated Tipping to start Athlete Institute. “I’m basically trying to create what I wanted to go to,” he told the Toronto Star. Athlete Institute had essentially become a college prep school, just like Findlay Prep, Huntington Prep, Montrose Christian and all the other major high school level programs in the United States. But it was up in Canada. 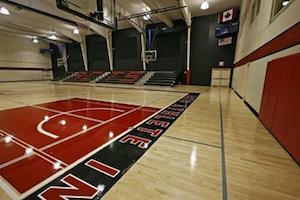 And Blunt thinks the facilities and resources are even better at Orangeville and Athlete Institute. 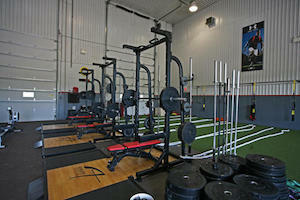 It seems almost paradoxical that Athlete Institute has big posters of Wiggins and Ennis on the walls of its fieldhouse. Paradoxical because Blunt and Tipping are actually trying to convince guys with the talent of Wiggins and Ennis to do something they did not do – stay in Canada. Toronto is actually the fourth largest city in North America with about 2.8 million people behind only Mexico City, New York and Los Angeles and ahead of Chicago and Houston. And it’s well documented the number of future NBA players that the Greater Toronto Area has produced over the years. Anthony Bennett, Sim Bhullar, Tyler Ennis, Cory Joseph, Andrew Nicholson, Kelly Olynyk, Nik Stauskas, Tristan Thompson and Andrew Wiggins all are from the Toronto area. But Olynyk and Nicholson were the only ones from that group who remained in the land of the Maple Leaf over the course of their entire high school career, Olynyk attending South Kamloops while the late bloomer Nicholson went to Father Michael Gomez. The others? Well, Bennett, Joseph and Thompson all left Canada for the renown Findlay Prep in Henderson, Nevada, and Bhullar and Wiggins both attended the equally famous Huntington Prep in Huntington, West Virginia. So Blunt and his group started their work fighting an ever-growing trend as those were only the Canadians from the Greater Toronto Area. There have been plenty others ready to follow in the footsteps of the Wigginses and Ennises and Bennetts, leaving Canada early to finish high school in the states and take a short trip to a US college before landing in the NBA. How could Blunt slow that movement down? Jamal Murray had already made a major name for himself at 16 years, having become the second Canadian to win the MVP at the Jordan Brand Classic international game in 2013 following Duane Notice’s crown in 2010. Murray also shined at the 2013 FIBA Americas U16 Championship in Uruguay, where he averaged 17 points, six rebounds and 2.4 steals in leading the Canadians to a bronze medal. Just like dozens of Canadians before him, Murray was being offered spots at numerous prep schools in the United States. It was time for a decision for the 10th grader at Grand River Collegiate Institute in Kitchener. And this is where the aforementioned luck starts coming in. Instead of packing his things and moving to the United States, Murray chose Orangeville Prep, Athlete Institute and Coach Blunt. “I want to stay close to home while focusing on basketball and school … I’m looking to get bigger, stronger and faster and maintain the grades I need (for college),” Murray said at the time of the decision. Blunt tells his visitor that his time working with the CIA Bounce AAU team – where Murray played – assisted in Orangeville getting the nod. But the coach knows it was not an easy choice – especially in Murray’s circle of friends. And that the family really took a chance on Orangeville. “I think at that point, it was unprecedented. I don’t think there’s a word big enough to describe how much of an impact that had on high school basketball in Canada,” Blunt explained. After his first season with Orangeville, Murray was picked to play in the 2014 Nike Hoop Summit showcase – where he collected 10 points, five assists and two steals as a player two years younger than the rest of his opponents. At the 2015 Nike Hoop Summit, Murray poured in 30 points. Last summer, Murray was a leading force for Canada at the 2014 FIBA U17 World Championship, averaging 16.4 points, 4.6 rebounds and 2.9 assists. And this season, his second with Orangeville Prep, Murray would make his name even bigger – thanks to a schedule full of games in the United States. But once again, we’ll come to that shortly. First off, there is a bit more luck to discuss – or better said being at the right place at the right time with the right connections. Thon Maker was one of the biggest names in high school basketball, enticing fans and observers with a tantalizing mix of skills few players in the game have offered in the past. Many NBA Draft analysts pushed the South Sudanese-Australian up their 2016 draft boards. But Maker and his younger brother, the 1998-born Matur, were forced in August 2013 to leave the United States to renew their visas for immigration purposes. The Makers’ guardian Ed Smith decided to bring the brothers to Canada instead of travelling all the way to Australia. After the paperwork began taking longer than expected to process, Smith went looking for a place for Thon to train until everything was in place. And Smith eventually called up Orangeville to talk to Coach Blunt, who he knew from the Virginia basketball community a few years earlier. Blunt said Thon was immediately smitten with the place. How could you not with the promise of “Historic Charm, Dynamic Future”, not to mention first-class facilities. “I think Thon fell in love with the facility, and he fell in love with the pace of life here. I think he fell in love with being isolated away from a lot of the hype and the things he was getting and it put him in a position where he could really focus on basketball,” Blunt recalls. Blunt confirmed to his visitor that Orangeville plays by FIBA rules, meaning predominantly a 24-second shot clock. Almost all of U.S. high schools play without a shot clock at all. Yes, no shot clock. For a quick reference – and to keep the reader from shooting over to Wikipedia – the shot clock was introduced to the NBA in 1954 as a way to stop teams from just holding the ball and speed up the game. Things had gotten pretty severe, especially in the 1950-51 season. According to Wikipedia, the Fort Wayne Pistons defeated the Minneapolis Lakers by a record-low score of 19-18, including a 3-1 fourth quarter. The Pistons wanted to limit the impact of Lakers’ center George Mikan. A few weeks later, the Rochester Royals and Indianapolis Olympians played a six-overtime game with only one shot in each overtime. That’s not to say that Maker was playing games in the United States where teams held the ball for minutes at a time. But playing with a 24-second shot clock will prepare Maker and the other Orangeville players for the NBA and the game in the rest of the world. The move to Orangeville was also about the level of day-to-day competition at practice Maker would face – especially with eight of his to-be teammates being 6’5” or taller and three 6’9” or taller. But this travelling band of great players was much more than Murray and the Makers. Blunt went out and really improved a roster that already had a couple of solid players alongside Murray for the 2013-14 season. Of course, Orangeville getting Murray was a massive step forward for the project. But they also had enough momentum to lure two lost-sons back to Canada as Jalen Poyser returned to the Toronto area after spending the 2012-13 season with Findlay Prep and Nevell Provo trekked back across the border after playing the same campaign with Huntington. Poyser’s father Mark, who is a CIA Bounce coach, said Orangeville’s schedule was a big reason he decided to bring his son home from Findlay. “I believe in what we’re trying to do here in the Athlete Institute. As a coach with CIA Bounce, we’ve always said, ‘Man, what would happen if all the talent that left ever stayed home?’” Poyser told SNY.tv. 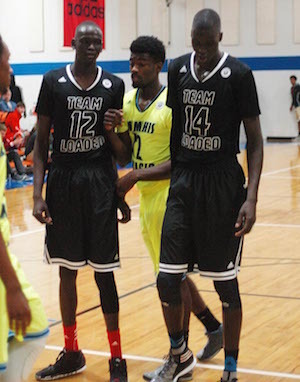 Blunt had also added the 6’9 and 220-pound big man Kalif Young and 6’9 Kyle Alexander. “When Thon and Matur decided to come and Coach (Ed) Smith, I think it really took the whole thing to the next level. I think when you look at those two guys (Thon and Murray), they will go down in Canadian history as two pioneers of this movement,” Blunt told his visitor. And then there was the schedule – which was full of games against high-level prep schools in the United States. Blunt’s Orangeville Prep was not the only Canadian high school to travel south to play games against United States opposition – Bill Crothers and Father Henry Carr being others. But Murray and company definitely took on the biggest load of games. While Blunt put together some high caliber competition which would give his players some big time exposure for later college scholarships, all of the games would be road games, and some of them would be preceded by some difficult travel. “That was almost impossible travel,” Blunt admitted. For the year, the team ended up going 34-11, a record with which Blunt definitely can live and one which makes him excited about the future. With so much having gone right in the first two years – getting Murray, the Makers and other high level talent and playing successfully in the United States – Blunt and Co. now face the next step. Murray and Thon Maker could assist greatly in the sustainability in another way as well. Both players are already drawing NBA attention. Their path to the NBA could lead to Orangeville and Athlete Institute having to expand. The option for both Thon and Murray is to reclassify, stay at Orangeville Prep and not go to college in the United States and be eligible as international players for the NBA Draft. Murray has already spoke publicly of such a move – which Sportsnet.ca described as “A Canadian lottery pick with a made-in Canada label”. “That would be great,” Murray said in the piece. Thon Maker is considering the same move – skipping enrolment in a US college to stay another year in Orangeville and then declare. When asked what would happen if either – or both – take the step, Blunt kind of shrugged his shoulders and said: “Who knows”. He did say the success of Orangeville this season has already led international, non-Canadian players to contact him about entering the program. That door could be bursting at the seams if Murray or Maker make the NBA jump. “Let’s wait and see,” Blunt offered with a smile. The visitor then figured he had already taken plenty of time from Coach Blunt’s busy schedule. The two walked back down the hallway before exchanging pleasantries and the visitor heading back to his car. Driving back to Toronto, there is no sign stating something like “Thank you for visiting Orangeville” or the like. But there in the rearview mirror, offering inspiration and promise to all coming the other way back to to the city is the sign: “Orangeville: Historic Charm, Dynamic Future”. The future certainly seems bright for Orangeville. Great article. I thought Orangeville was all about Lacrosse. I’m friends’ with Jeremy Noble, Orange native and one of the world’s best lax players. If you can share your article with Jeremy on Facebook, much appreciated. I saw the share from Hoops and I couldn’t share.